What would you do if you came home to find someone in your house? This is the predicament Polly Cooke faces when she returns to her new home. The first weeks in the house had been idyllic, but soon Jacob, a local man, is watching her. What does he want and why is he so obsessed with Polly? In a situation where nothing is what it seems, you might end up regretting letting some people in. 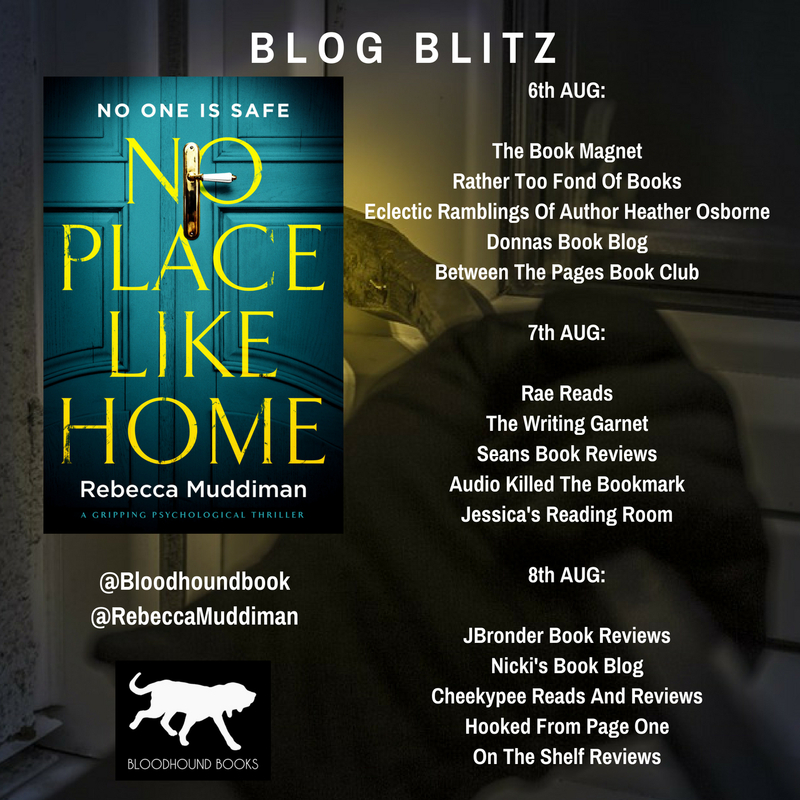 As she is a local North East author, I've wanted to read a Rebecca Muddiman book for a while so I jumped at the chance to read her fifth novel, No Place Like Home. It took me a little while to get into the book, as the chapters seemed to jump between timelines without notice, but once the pieces started to fall into place I realised what a clever book this is. I think as readers we are perhaps a little spoiled by having 'then' and 'now' labelled on chapters; sometimes it's obvious and other times it's not. 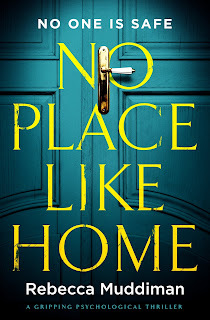 Well, No Place Like Home falls into the latter category but once you get into the rhythm of the book it does become easier to spot...so bear with it, readers! I have to be honest and say that I didn't have a clue what the heck was going on at first but I was definitely intrigued enough to find out. Polly returns to her new home one evening to find someone in her house; her fear turns to anger as she recognises the intruder when he puts the light on. We then jump back a few weeks to around the time she moved in and she notices somebody across the street watching her as she draws her curtains for the night. I hate the thought of being watched without my knowledge so I totally empathised with Polly; she should feel safe and secure in her own home, not threatened and afraid. When we find out that the man watching her is Jacob, an old schoolfriend of Polly's, I could feel my interest levels going up a notch. They weren't exactly friends at school but when they run into each other years later, Polly is too nice to say no to befriending Jacob...and Jacob doesn't want to be 'just friends'. I really felt for Polly when she tells one of those little white lies we often tell people to avoid hurting their feelings, only it means a lot more to them than we realise. I was thinking 'uh-oh, she's said the wrong thing there' as green for go flashed in Jacob's mind. Now I can't say too much else about the plot without giving the game away, but I just have to say that I have never been more wrong about a character in my whole reading life. The feelings I had towards this character did a complete 180 as Rebecca Muddiman shows us how very deceptive appearances can be. 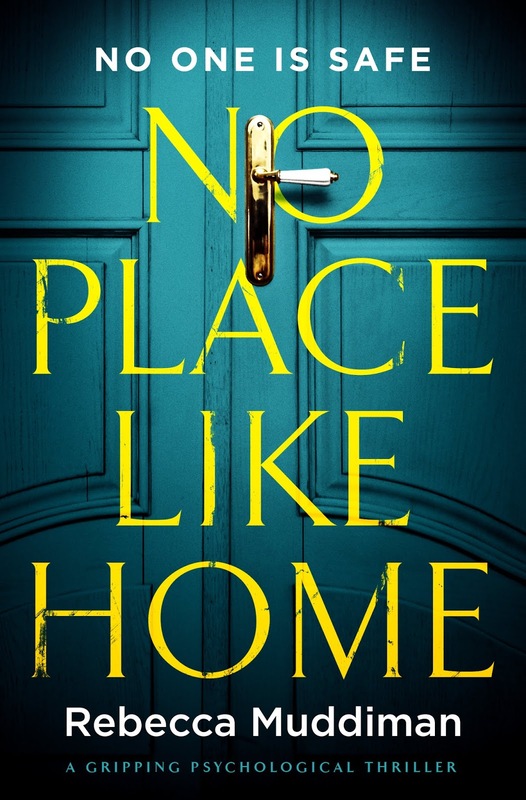 No Place Like Home is sinister, unnerving, creepy and utterly surprising. I felt as if Rebecca Muddiman had got inside my head and pulled all the right strings before revealing how very manipulated I had been. Well played, Ms Muddiman! I chose to read an ARC and this is my honest and unbiased opinion. 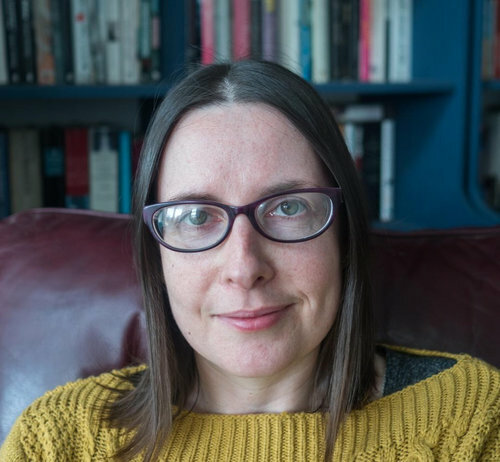 Rebecca Muddiman was born and raised in the North East and worked in the NHS for many years. She has published four crime novels – Stolen, Gone, Tell Me Lies, and Murder in Slow Motion. Stolen won a Northern Writers Award in 2010 and the Northern Crime Competition in 2012. She is also a screenwriter and was selected for the London Screenwriters Festival Talent Campus in 2016. Most of her spare time is spent re-watching Game of Thrones, trying to learn Danish, and dealing with two unruly dogs. Sometimes all at the same time. 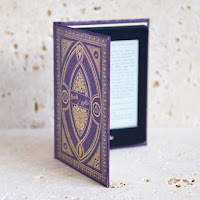 KINDLE CASES FROM £10 - FREE UK P&P! !